So, in I chimed, and was directed to a clip from this mornings Today Show in which Jenny McCarthy and chef/astrologer Sabra Ricci do indeed mention Scorpios, asparagus and reproductive organs as part of a segment touting Ricci’s new cookbook Lobster for Leos, Cookies for Capricorns: An Astrology Lover’s Cookbook . The premise is that each astrological sign governs a different part of the body, so people should eat foods that bolster the organ governed by their sign. Though it sounds like a whole lot of nonsense to me in terms of specific health benefits, the recipes that Ricci shares do seem healthful and delicious–and the cookbook looks like a really fun read and would probably make a great gag gift. 3. 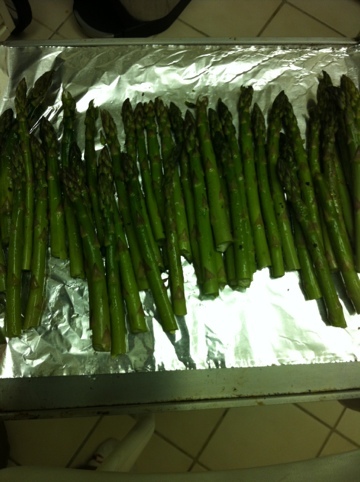 Arrange asparagus, in a single layer, on a foil lined cookie sheet. 4. Drizzle with olive oil, sprinkle with salt and pepper and smush them around with your hands to make sure that the asparagus are all coated with goodness. 5. Roast for 10-15 minutes, depending on thickness of asparagus and your preferred doneness. Please don’t turn them into a brown mushy mess, if that’s what you want–just go buy canned ones. Tip: Asparagus look like a little bit like paint brushes, so young children may enjoy dipping the brush end in salad dressing or some other mushy food and ‘painting’ their plates while they eat. 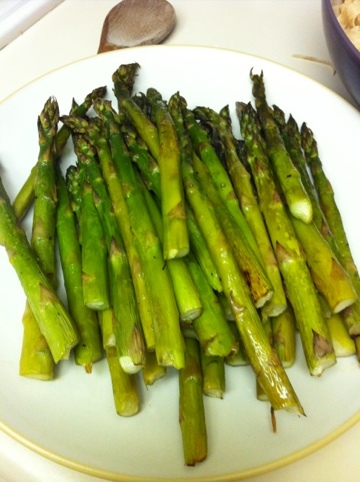 Note: Asparagus can be somewhat stringy and hard to chew for toddlers, so watch them carefully! You may even want to cut them up into bite-sized pieces. This entry was posted in A Peek Into My Kitchen, Baby Food, Food and Drink, Food related, meatless monday, Misc. and tagged #meatlessmonday, a peek into my kitchen, asparagus, astrology, Cookies for Capricorns: An Astrology Lover's Cookbook, jenny mccarthy, Lobster for Leos, meatless monday, natalie morales, nbc, sabra ricci, the today show, today's kitchen, wendi aarons, wendy brandford by jessica. Bookmark the permalink. awesomeness!! my son actually like the asparagus more than I would have thought (which is, at all).